Omg thank you for replying so fast you’re awesome! !! Haha! no problem. I’m just writing a new pattern and happened to be online. 🙂 I’ve updated the muzzle, and it should work. Let me know if I went wrong anywhere. Thanks! Hi there. I’m confused about round 1 of the muzzle. I ch5, turned work, started in second chain from hook, sc in each of the next three chains. Now what? Do I turn work again? Sorry about my average pattern writing skills. Yes, you work in rounds around the chain 5. And then proceed with the next rounds. I’ve updated the changes to round 1 in my blog. Thanks for letting me know. R1:Starting in second ch from hook, sc in next 3ch. 3sc in last ch. Rotate work and continue 3sc in back loop of 3 chains. (12 st total around). Does anyone have any ideas about how to do the eyes on this lion i have it all finished except for the eyes i would greatly appreciate some help figuring it out. Thank you! Then thread white coloured yarn to a needle and make a single stitch on it so that it appears like the light reflecting through his eyes. Now thread the yarn used for his body to a needle and make parallel stitches, covering quarter of his eyes. These should appear like the eyelid, almost making him a droopy eyed lion. Hope it makes sense. if sewing doesn’t make the cut, try felt cutouts for the eyelids. Hello, I’m new to this. But I really want to make this lion for a baby shower gift. What is rooting? How is it done? This video should explain how rooting is done. Hope it helps. It’s me again. What did you use for stuffing? And it looks like you used an E hook, am I right? Hi, yes I’ve used a 3.5mm hook which is an E hook in the US measures. I’ve used fiber fill for the stuffing. Good morning. Thank you very much. the video is perfect. One last question. I am creating a PDF document with the pattern so i can save it in my electronic device. As i copy and paste i noticed the Head, Legs, and Arms of the pattern are missing rounds. Is this a fact or is it save to change the round numbers so that they follow in sequence? yes. That is what I was thinking. I just needed to make sure. I can email you the PDF if you’d like. I’ve included the comments because the suggesstions are helpful. I emailed the PDF to your email address. Feel free to request any edits. Thank you again for the cutest lion amigurumi pattern. 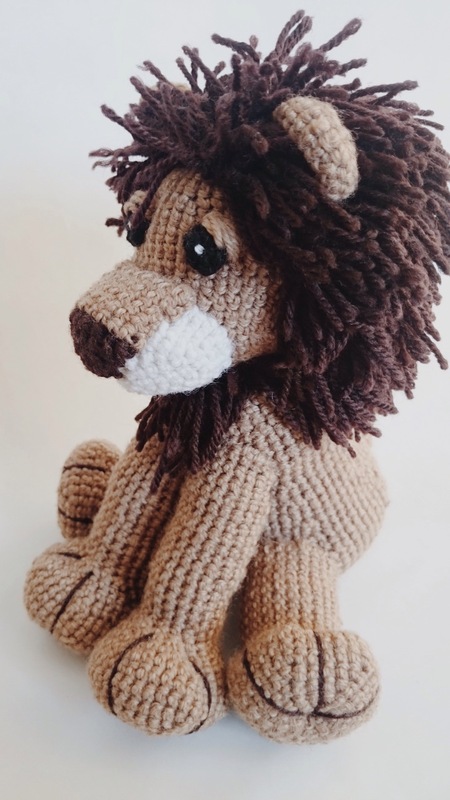 Thank you for sharing this adorable lion pattern! Do you have the directions for the tail? Thank you Dianne, I’ve updated the blog post with a pattern for tail. I hope I’m making sense and it helps you. Feel free to let me know if it doesn’t work. This is an adorable lion, the best one I’ve seen. Thanks for the tail pattern. Hello. I caught this just in time. I’m a Leo & this lion fits my personality perfectly. Doing it as I type. Was wondering how to do the tail though? Thank you. Good that he suits you, :). I have updated the blog with the pattern for tail at the end. Hope it helps. Let me know if I’m not making sense. I would like to know what can we do between row 10 to 17 of the Head ? It means you have to sc around all the rounds in between. Hope it makes sense. It’s not missing, it means those rounds in between have the same number of stitches i.e., sc around for all the rounds. Hello I want to try this but I am unsure of hook size and yarn. DId I miss it ? Thank you for this adorable lion pattern. I love it. hi. I’ve just started crocheting this. I’ve finished the head. When you say finish off, do you mean end with a slip stitch and leave the hole and then sew the head on the body or do you continue with the decreasing pattern until the hole is closed? thanks! Hello!! Is there somewhere a video that you can provide for the muzzle? I have no idea how to do it. Im just starting out and this is only my second project! Please and Thank you!! Hi there, I’m sorry the round 1 pattern for the muzzle was rubbish no wonder you had a hard time figuring it out. I’ve made the changes now, hope it helps. Reblogged this on My world in this world. Adorable! He’s wonderful. I have a question about the yarn. Did you use DK or worsted weight? Thank you for sharing your pattern. You’re very creative. Thanks. I’m not well aware of the yarn types, and on a google search I’m thinking the yarn I’ve used is a worsted one. Hope I’m right. I am extremely confused on how to make the muzzle. I really love this pattern and would love to make it but I’m having a very difficult time with the muzzle. Could you please explain to me how it is done? Thanks so much!! I have a website for freepatterns in dutch. Now i want to ask you if i may translate this en put it on my website? i will put copyright with the pattern. I hope you will say yes. Thanks like the lion and will make it also. I will put a link for all to see en use in mij forum. And i hope my members will visit you often. How much yarn did u use for each colour? Pretty cute lion 🙂 can t wait to try this pattern. I’ve used 2 skeins of the light brown colour, and one of dark brown yarn. And some white and black yarn. I love this pattern. Thanks for sharing. One question: how did you stitch his toe nails? How did you do the mane under his chin? When do you attach the head to the body? Hi Jen, I sewed his head to the body first and only then started rooting his mane. The mane under his chin had to be rooted to the head just below the muzzle. Hi, I’m from Argentina and I tried to do this beatiful lion please try to explainme whats mean TOGS for the mane . Thanks a lot. Reblogged this on Yarn Junkies. Thanks for the free pattern. I wish I could say that I am going to go out and make bunches of these guys for Christmas – but that’s only a wish. Thanks for all your patterns! How would you make this bigger like double the pattern? Sorry Tenauh, I am not really sure how that works. Hope you’d be able to use this as a guide and make him bigger. I doubled the yarn and followed the same pattern. Then on the nose, eyes, mouth and tail I did it with one strand, otherwise it was too big for the lion’s body. I didn’t do a mane cap and just attached the mane to the head and did two strands in each hole. I can send a picture of what mine turned out like if you would like. I would just need your email address. Mine is sistersfancystitching@gmail.com. I hope this helps!! Such a fun cute pattern. Thanks Stefanie, your version sounds great! I would love to see a picture of yours. Send it over to hellostitchesxo@gmail.com please. Hi Jessica, I’ve used acrylic 8ply yarn and 2.5mm hook. Something similar should work well with this pattern I think. Thank you for sharing your pattern., and the links to the tutorials. They are very helpful. Your creations are precious! I don’t crochet next to my computer. Why can’t I print it? I understand, as of now you can may take a screenshot. I’ll try uploading a printable downloadable version as soon as I learn how to do it. Thanks for sharing! Im trying to do the nostrils. In round 2 it says you end uo with 10 stiches but you really end up with 9; I think that changes the next rounds. Hi! 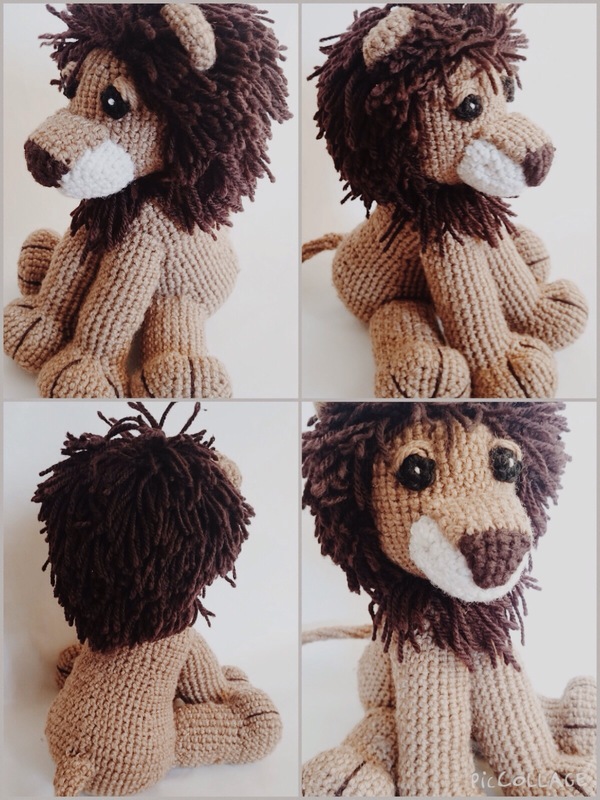 I love the lion and am in the process of making one for my nephew but am a bit confused on the crochet hook size. In the pattern you say you used a 2.5 mm hook but later in the comments you say it was 3.5 mm. Which size did you use? Hallo nur mal ne frage was soll das tog heißen. Sc sind feste Maschen aber aus tog werde ich nicht schlau. Hello! I’m not sure if this is what you are asking for. Did you want an explanation for sc2tog? It means using sc to join two sc together. Hi Danielle, I’m glad you like the pattern. As much as I’d love to do video tutorials, I do not have the time for it now. I’m expecting my first child any minute now(getting close to the due date) , and I’m afraid if I start with it I may not complete it. But I do intend on making them for you once I’m back and settled in. Sorry I couldn’t be of any help as of now. Thanks for asking. Thanks😃. Good luck to you too on the lion, let me know if you’re stuck somewhere, I’d be happy to be of any help. Crocheting this guy is a blast! After reading several comments about hook size and yarn size, I would like to say I used 4 ply yarn and a 5mm hook and he turned out great. If you want him bigger I suggest going up a hook size. It does make him less firm but it works. Thanks for sharing this pattern free of charge! I’m glad you liked it 😊 And thanks for the feedback! Hello, i am having a hard time making the muzzle I can’t understand it. Do you have a video where you show how to make it? Thank you.